Visitors may view our large selection of maps. Chilliwack Museum and Archives online collections catalogue. Memory BC, the Archival Association of BC’s union catalogue. The Archives collects hard copies of Chilliwack’s newspapers: Chilliwack Progress (1981-current), and Chilliwack Times (1981-2016). The Chilliwack Progress Newspaper are now available for keyword searching online. 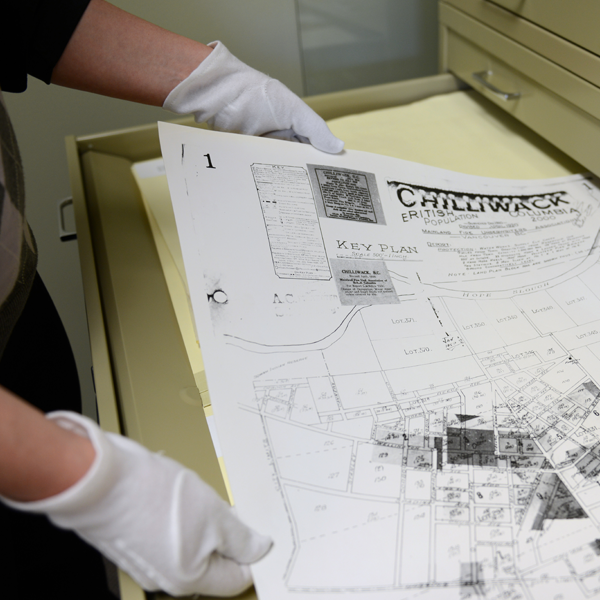 ** The Chilliwack Progress Newspapers have been digitized thanks to grants from the Irving K. Barber Learning Centre (UBC), the City of Chilliwack, and the Chilliwack Foundation. Search our photographs through our online catalogue. Visit the Archives to receive assistance searing the photograph collection. Order copies of photographs for personal or commercial use. Township of Chilliwhack minutes, tax records, by-laws, police court record books. City of Chilliwack minutes, tax records, by-laws, maps. The Archives holdings include a selection of artwork with Chilliwack provenance. This artwork is available for viewing at the Archives and on our online catalogue. Materials from our reference library are available for viewing at the Archives. Materials are listed in our online catalogue.